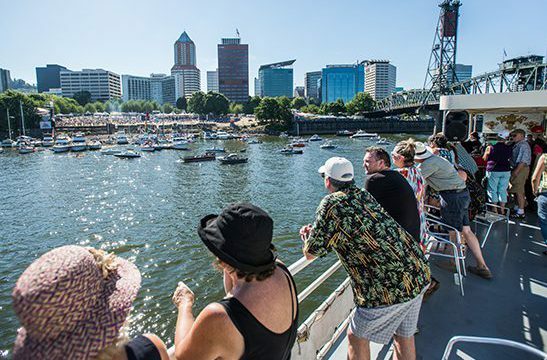 Cruise the beautiful Willamette River and hear the blues in an intimate setting on the Portland Spirit. A no-host hors d’oeuvres buffet and full bar are available on all cruises. Boogie-woogie rock piano legend Commander Cody, and phenomenal young sister duo from Georgia, Larkin Poe, hold court on the middle deck. Southern soul man Rawls croons on the lower deck, while Delta bluesman ‘Duck’ Holmes gets the upper deck rockin’ with blues from Bentonia. • Hoodoo Moon Cruise (11 pm – 1am): Ranky Tanky, David Vest Band, Ty Curtis, Mary Flower & Mark Shark. • “Sail on Sister” Cruise (3-5 pm): NW Women in R&B “Tribute to Denise LaSalle”, Barbara Healy, Kelly’s Lot. Sonny Hess and NW Women in R&B pay tribute to the late, great Southern soul diva, Denise LaSalle. Eugene blues belter Barbara Healy and her quartet hold forth on the lower deck while California singer-songwriter Kelly Zerbes & Kelly’s Lot are featured on the upper deck. Open to all who dig the groove of the blues, this cruise is geared to the dancers in the crowd. Featuring San Francisco soul man McKinley ‘The Voice’ Moore, Rose City bluesman Kevin Selfe joins two of the Northwest’s premier blueswomen, LaRhonda Steele and Karen Lovely, in a rare collaboration. And if you haven’t yet caught Mississippi bluesman Duck Holmes, this is your last chance, and alone worth the price of admission! All Blues Cruises board from the seawall at S.W. Salmon and Naito Parkway, in front of Salmon Street Springs Fountain, just north of the Oregonian Front Porch Stage. PLEASE BRING YOUR PHOTO ID. All passengers 18 years of age and older must present photo ID upon boarding. All carry-on bags are subject to inspection, and passengers may be photographed. The cruises will head south up the Willamette River to Oregon City, and/or north past the Port of Portland docks. Afternoon cruises are open to all ages and board at 2:30 p.m., returning to dock at 5:00 p.m.
All evening cruises board at 10:30 p.m., returning to dock at 1 a.m.
Blues Cruise tickets are non-transferable and non-refundable. Don’t miss the boat! Purchase your ticket before the festival begins. The popular. Blues Cruises sell out quickly.